The Atacama Desert is located about 1600 km north away from Santiago (capital city of Chile), holds numerous wonders of other worldly beauty. It is a desert stretch more than 1200 kilometers away and is one of the driest places on planet Earth. Contrary to the presumption of “there’s nothing in there”, it offers remarkable experiences to reconnect with nature, especially if you travel solo. In this country of volcanoes and geysers, it is all in one package which is good to go to. 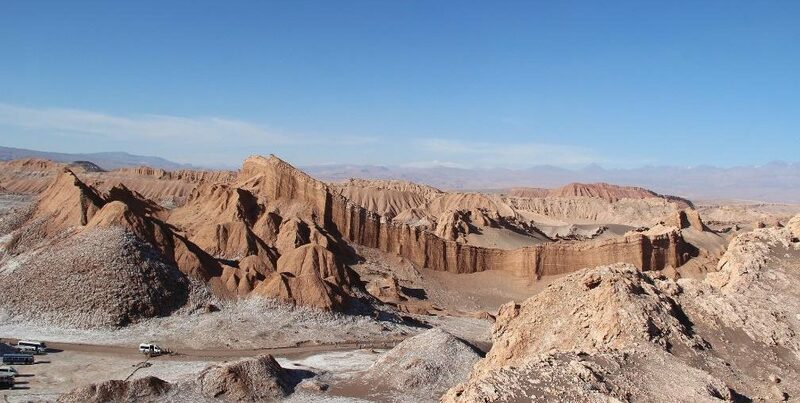 The beginning of your journey will start in San Pedro de Atacama, a town of the tourists as the base to stay. This town used to be a quartz and copper mining town, but now it has plentiful of accommodations ranging from the backpacker budget to luxurious class. Selection of cafes and restaurants are also available among the adobe buildings and dusty road and importantly have tour agencies to take you around. Moon Valley situated 17 kilometers away on the west of San Pedro de Atacama. It is truly an alien area where the winds and floods have created sharp cliffs, stones sand formation into a surface similar to the moon, thus this place is called Moon Valley. The natural texture and colors of the desert are varied. Moon Valley also has a dry lake where the sun makes it’s stone diverse with red, blue and yellow colors. The best thing to do in Moon Valley is sunset watching, where you have the ultimate view of lowing light, deep colors and textures of the rocks. For the best view, walk across the wavy rocks to reach a cliff and slope and avoid big dunes where the tour buses crowd the area. El Tatio is an area of geysers 50 kilometers of San Pedro de Atacama. There are only 7 places in the world like this and El Tatio is the third largest after Yellowstone and Kronotski in Russia. This place is best enjoyed in the early morning. Soak yourself in the hot spring in El Tatio during the dawn while embracing the magnificent view of rising light. You will have the chance to feel the stark difference of boiling hot water and sub-zero temperatures in an exotic space. Salar de Atacama or Salt Flat is the largest salt flat in Chile. This peculiar Salt Lake is stretching across 3000 square kilometers and surrounded by volcanoes and lunar landscapes. By the evening the salt form captivatingly vast honeycombs shape. Another treat for your eyes is the long-legged flamingoes pecking on the flat. The vast and solitude of this place are truly as remarkable as the landmark of Chile. The neighboring site of Salar de Atacama is the lagoons that have a high concentration of salt such as Laguna Cejar. The salt in the lagoon is so high (higher than the Dead Sea) that you can just float effortlessly! While enjoying your solo travel to the Atacama Desert, don’t miss out the chance to visit Yerbas Buenas Petroglyphs. In Yerbas Buenas you will see the legacy of ancient cultures among hills and rocks of multiple colors hence this place is called Rainbow Valley. The petroglyphs are very well preserved you would be able to see the rare life of civilization dated back from thousand years ago. 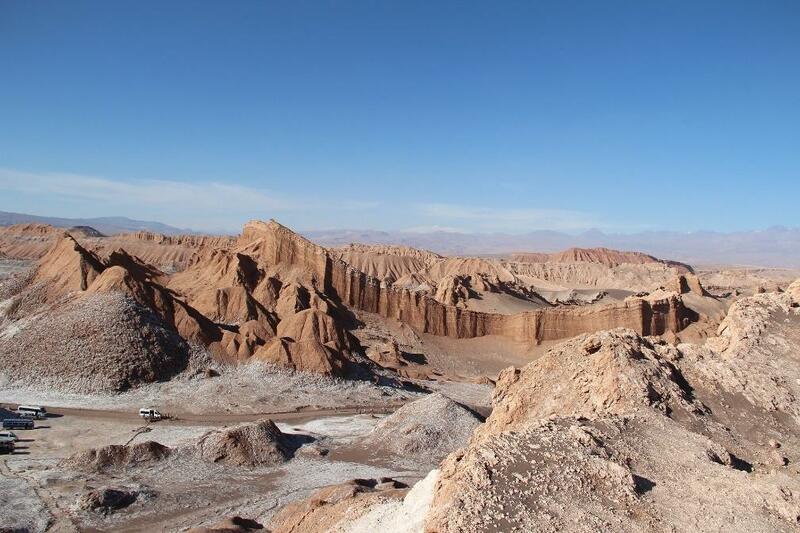 Before going solo to the Atacama Desert, you need to research the places you want to visit. The numerous natural destinations are all worth to visit but it’ll take more than a week to get the best out of it. Therefore, plan the spot you really need to visit and then adjust it with the tour packages. Choose the tour that provides flexibility and small groups where you can savor and enjoy your journey. Chile is a relatively safe country to travel, but it won’t hurt to get precaution like getting immunization shots, just in case. Learning a little bit of Spanish will truly help you to connect with the locals. Studying the daily used words, common phrases, or sentences such as numbers, items, menus will make you understand more about what’s going on around you. Researching the weather about the Atacama and the places you want to visit certainly will help. Generally, the weather in the Atacama as in many deserts are drastically different between day and night. During the day, the temperature may reach 22º C and during the night may drop to 1º C. Therefore, bring light clothes to travel and a winter jacket to protect yourself from low temperature. The warmer months usually happen in December to February (high season) while the shoulder season happens in spring or autumn. Don’t forget to bring enough cash. In the Atacama Desert, you’ll probably find tours only take cash whether in US dollars or Chilean Peso. There are also ATMs, but they have limits and you’ll also be charged 5-10 USD per withdrawal. This town used to be a quartz and copper mining town, but now it has plentiful of accommodationsranging from the backpacker budget to luxurious class. Now go out there and book your flight with us!